Tequila Lime Chicken is packed with vibrant flavors and cooks in under 30 min – A fun and festive Mexican-style dish perfect for friday night dinner parties and week-night meals alike! We eat a lot of chicken at home. Healthy, inexpensive and easy to dress up with your favorite flavors, some of my favorite recipes usually involve chicken. From Coronation chicken salad or grilled Thai-style chicken, to awesomely good zucchini & chicken nuggets, there’re tons of different ways to use this lean protein. Plus, you get plenty of nutrients by eating poultry. If you’re looking for a great source of light, low fat protein, this bird fits the bill. Chicken breast is high in protein and low in fat and calories, making an ideal choice for weight maintenance and to keep you energy levels up. Did you know chicken is also one of those foods that raise your serotonin levels naturally? I’ll tell you what, this tequila lime chicken definitely raised mines – It’s SUCH a feast for your eyes and tastebuds! I know summer is over, but it doesn’t stop me from craving summery, bright and refreshing dishes every now and then. And that’s when this awesome Tequila lime chicken comes to rescue. 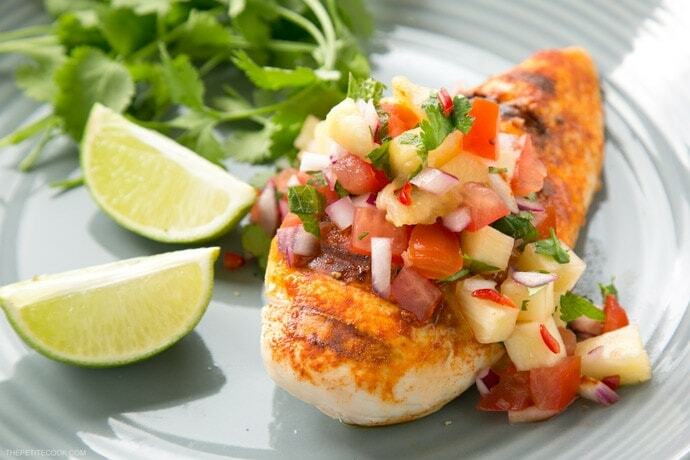 Packed with vibrant flavors, this tasty tequila lime chicken breast is ready in just 30 min. Make sure you marinate the meat for at least 15 mins, but best for 2 hours. I usually marinate it the night before, which makes lunch and dinner time prep a breeze the next day. Tequila, red chili, honey and simple spices such as paprika and cayenne pepper, come together to make a chicken marinade that’s excitingly flavorsome. I replace lime juice with the zest, because I find that citrus juice makes somehow the chicken less tender. I like to squeeze a little fresh lime juice over the chicken before hits the table. 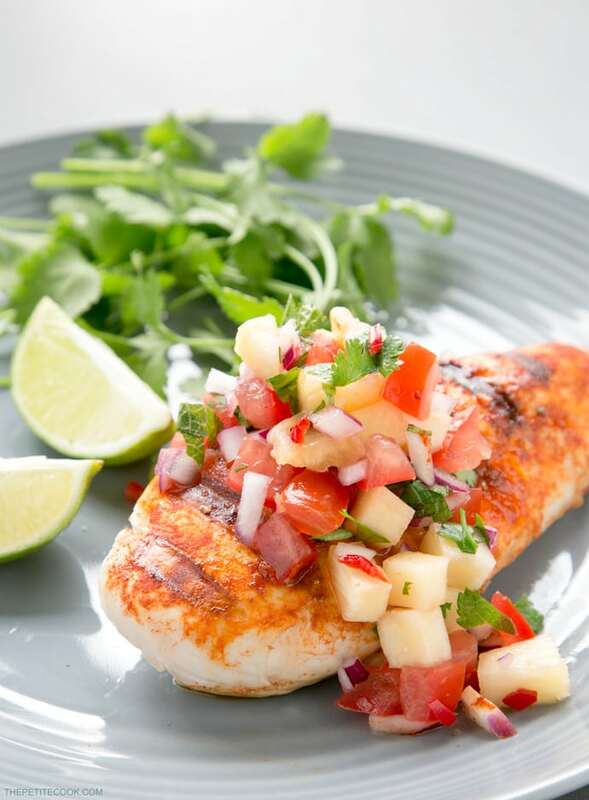 Top with freshly chopped cilantro and a generous spoon of easy fresh pineapple salsa as shown above, or try my go-to mango salsa. It’s also delicious with a spoon of guacamole sauce all over the top. For a nicely char-grilled chicken use a bbq or a helpful electric grill ( I often use this one, which comes with a handy integrated meat-thermometer). You may also opt for a cast iron grilling pan. Alternatively, sear the breast on an oven-proof skillet pan. Simply pan-fry the chicken on both sides until slightly browned. Then transfer the skillet into the oven and bake for 15 minutes or until the chicken is crispy and nicely browned. However you serve it, I promise this tequila lime chicken is super juicy and tender and exploding with exotic flavors! Tequila Lime Chicken is packed with vibrant flavors and cooks in under 30 min- A fun and festive Mexican-style dish perfect for friday night dinner parties and week-night meals alike! 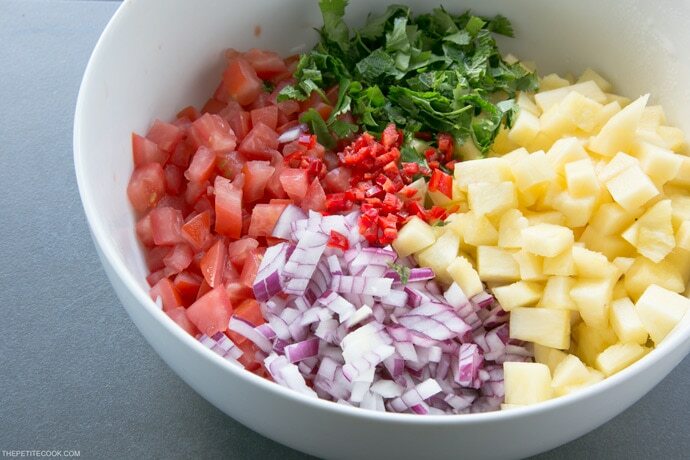 Whisk all the marinade ingredients together in a bowl. Add the chicken breasts into the marinade, and stir well to combine. Divide the chicken into two zip-log bags, and pour half the marinade on each breast. Close the bags and marinate in the fridge for 15 minutes but best for 2 hours. Drizzle with oil a grill pan, and heat until medium-high heat. Place the chicken breasts on the grill and spoon any remaining marinade from the bag over top. Grill, covered, for 4 minutes one one side. Turn the breast and cook a further 5 mins. Wow! 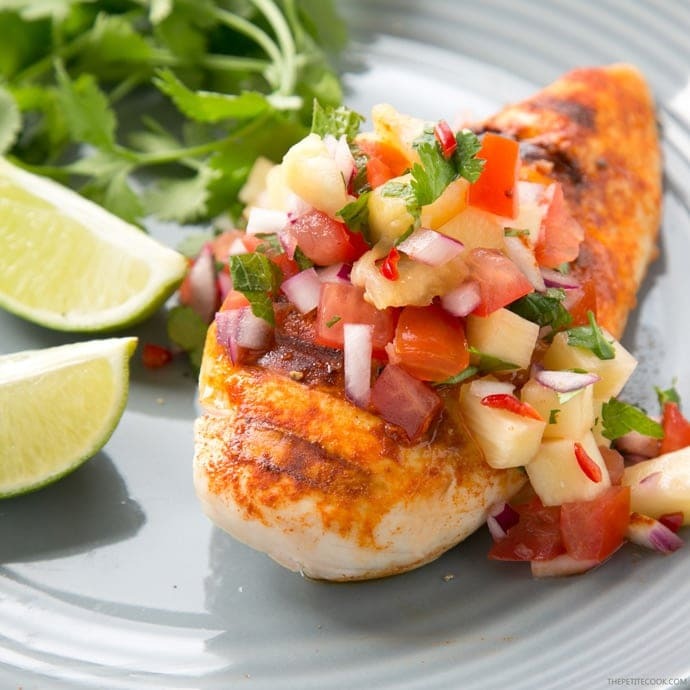 This is a great recipe, and that pineapple salsa really made it interesting. Fun to make too! Thanks for sharing, definitely going to remember this one. Thank you Andrea ! Perfect for a week dinner. Keep on rocking !